(Health Warning: this is to be read with your sense of humour switched on.) As you can see from Aisa’s very nice last post on this blog, we are currently in the second year of field work for our project on food security and biodiversity conservation in southwestern Ethiopia. So far, we have done hundreds of interviews, dozens of focus group discussions and workshops on a wide range of topics through which we involve stakeholders in the research process. This involvement of stakeholders in sustainability science is usually referred to as transdisciplinarity and it is meant to enrich the research process, to co-create knowledge, to increase relevance and finally to facilitate joint problem solving. As opposed to this concept, this blog post introduces the concept of reverse transdisciplinarity, which is completely new to sustainability science. 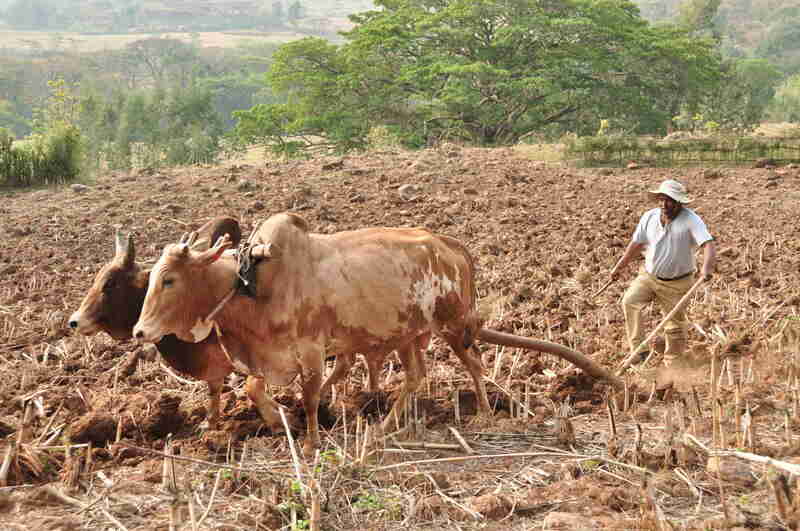 Reverse transdisciplinarity means the active involvement of researchers in real world processes, as for example in farming activities (see Fig. 1). This involvement truly empowers local stakeholders and I am pretty confident that it promises to become a key method in sustainability science in the very near future. I am looking forward for many examples of how to implement it posted in the comments section below. 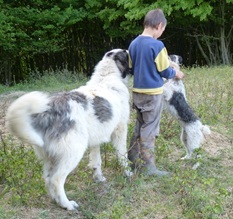 Sheepdogs in Romania: blessing or curse? When I first came to Lueneburg, I was warned by my colleagues to be careful with aggressive sheep dogs while doing fieldwork in Romania. My first reaction was, Yeah yeah you are overreacting, I grew up with dogs and I am not afraid of them and probably will not be in Romania either. Well my view on sheepdogs changed the first time I met them, and since that moment they do scare me. In fact when we see sheep in the distance, which can be several hundred meters away, we already start plotting how to get to our site and at the same time avoid running into the dogs. Sheepdogs are traditionally used in Romania to guard sheep against the attacks of bears and wolves. The landscape has still extensive forest that harbors bears and wolves despite the fact that the landscape is scattered with villages. Transylvania is one of the few regions in Europe where large carnivores and humans share the same landscape, and this can and does lead to conflicts from time to time. Keeping dogs to guard your sheep is the most effective way to prevent livestock depredation, and the majority of shepherds we interviewed indeed mentioned dogs as the key to keep sheep depredation low. Thus, dogs are a valuable asset to Romanian shepherd life and shepherds are willing to invest in dogs – one shepherd told me he had just bought two puppies of 300 euro each. Of course I encourage keeping this tradition alive and I have a lot of respect for the Romanian community of still being able to coexist with large carnivores without major conflicts (at least in our study region). Nevertheless, being surrounded by 10 angry dogs, frantically trying to keep a stick length between you and the dogs, while desperately hoping the shepherd will intervene and safe you from this situation does make me wonder whether Romanian sheep dogs are a blessing or a curse. To give you a better understanding on the different types of sheepdogs we encounter we started categorizing the dogs in the field. Among many, we created 4 new main subspecies of Canis lupus familiaris and classified them by the IUCN Red List as we saw fit: Canis lupus familiaris barkius (least concern), C. l. familiaris non-barkius (endangered), C. l. familiaris on roadius (least concern), and C. l. familiaris pookie-pookie (critically endangered). 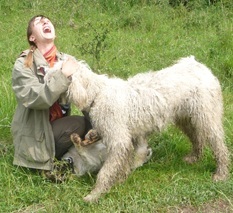 As you can see barking dogs are still very common. Now this can be a good thing as barking dogs don’t bite right. On the other hand it is quite a frightening sound when there are many dogs barking and they show their big teeth and give you the vibe that all they want to do is eat you. The on roadius type is a special character on its own, although maybe a little suicidal. In brief, they wait for you on the road and than they attack the car with the determination as if the car is a big monster that has to be eliminated (see video). Luckily, the car protects us against the dogs but the fear still exists that you might hit a dog and have to explain it to the shepherd. Or, just imagine you are making a nice bike-ride instead, that would change the feeling of encountering C. l. familiaris on roadius. On the positive side, the best dogs to encounter are the one of the pookie-pookie type. Basically they look big and angry when you meet them at first but than talking to them in a soft voice and calling them pookie-pookie changes the dog’s entire behavior (see picture). Suddenly he remembers he is also just a dog and starts wiggling the tail, rolling around and begging with big eyes to be petted. After some playing time and being covered in dog slobber you can happily move on without any further problems. These are really the best dog moments but unfortunately most of the time the dogs did not respond to pookie-pookie but rather to some harsh yelling and waving of the stick. Now back to the question whether these dogs are a blessing or a curse, and what does this mean for biodiversity in the region. There is no doubt that they protect sheep from carnivores, which in turn might protect carnivores at the same time, as it is a way for shepherds to coexist with carnivores. On the other hand, hunters have complained that dogs hunt in the forests on deer, which could have negative impacts on their populations. This problem however could be mitigated by feeding dogs enough good quality food and train them to stay with the sheep or at the sheep camp. A second problem could arise that the presence of sheep dogs could hamper development strategies such as eco-tourism. Eco-tourism is often suggested as a sustainable viable option for rural development. Sheepdogs like barkius and on roadius, however, make hiking, biking, or outdoor activities difficult or an unpleasant experience for tourists. Instead biodiversity might benefit from low tourism as certain development, like the replacement of dirt roads into gravel/asphalt roads could reduce important habitat for (threatened) amphibians. Thus, whether dogs are more guardians of biodiversity or a threat to biodiversity to me is still an open question. Overall, I still think that dogs in Romania are still a blessing although we should minimize the chances of them becoming a curse. For this to happen it will be necessary to find pro-active conservation strategies to maintain and increase the population of well-fed critically endangered C. l. familiaris pookie-pookie! The title of this blog entry is a bit all over the place, but I’m aiming for the content to be as crisp as ever. Just a few days ago, an engaged discussion that I had with a colleague (who shall remain unnamed) led to one of life’s truly grand insights — well, perhaps to be taken with a grain of salt. To all religious and non-religious people alike, don’t be offended by this insight, because indeed, it’s just a metaphor that is neither pro- nor anti-religious. So, please, don’t interpret the following metaphor as either religious zealotry nor as anti-religious propaganda, because it’s neither. Many scientists interested in sustainability or conservation believe that it is necessary to do good science — but they also see part of their mission as somehow informing (or even influencing) policy. It has become somewhat of a mantra among “sustainability scientists” that we need to work on problems and find solutions. I, personally, strongly favour science that is solution-oriented rather than “fundamental”. But perhaps I’m wrong? Here’s why. Policies are fickle. They come and go, and they usually address problems within the boundaries of what is deemed politically feasible. Often, this amounts to managing “fast variables”, or symptoms of sustainability problems. Favouring science that is policy-relevant thus means limiting science to questions that are relevant to current policy — it implies working on things that can be tackled rather than pondering fundamental problems (or “slow variables”) that ought to be tackled, but very likely won’t be by any policies at this point in time. Fundamental sustainability questions relate to how we live, what is a good life, and how we ought to share this planet with other creatures. These are key questions: but they are not directly policy-relevant. In some settings, you find that nobody wants to hear your science. You may find your science policy-relevant, but policy makers may feel differently. This might be because you’re doing a bad job of communicating your science; but it could also be because the question you are asking do not match the symptoms or fast variables currently on the radar of policy makers. To those who feel their work is not relevant enough to policy, or has failed to influence things for the better: perhaps you’re wrong. Some work is hugely influential by gradually contributing to changes in how we think about problems. Thinking about problems in new ways, shedding light on problems that previously were not considered, and infecting others with such new ideas amounts to shaping an intellectual basin of attraction. If your ideas are good, others become attracted and possibly infected, and one thing leads to another…. take resilience: it started as a specific concept but gradually turned into resilience thinking, with a whole body of scholarship attached to it. We should not (only) judge Holling’s original paper by its specific relevance to forest policy — its bigger contribution may have been that it has helped to shape an increasingly influential intellectual basin of attraction. Many people have left legacies not because of policies that they changed but because they influenced people’s thinking. So, should we engage with policy? Probably. But perhaps an equally important service is to contribute to the shape of intellectual basins of attraction. Sunday morning thoughts from Béla Hamvas about interests and actions with messages for researchers too – for the not so serious moments series of this blog. I only now start to understand many of his writings and thoughts after certain kinds of life experiences. For example, I shifted from a purely passion (…this is also a kind of interest after all…) based research and teaching to a research where the driving interest is in a higher proportion represented by impact factors, citations, number of papers and projects, desire to show. Things get meaning only if they happen publicly and the world knows about them. It is increasingly hard to find that pure thing in all these as I felt before. Therefore the main task of Hamvas (see below) will also be a personal chellenge in the future: to do research and teaching and conservation just purely for what they are. 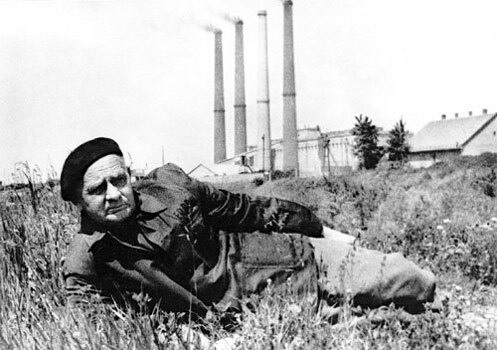 I am reading the book of Juhász-Nagy Pál entitled “Nature and people: small variations for a big theme” (the book is in Hungarian, the translation of the title is just a trial). In one of his insightful essays, starting with the name of the UNESCO program called “Man and Biosphere” he reflects about the need for recognizing the right/healthy order of things when we speak about something, especially if we address nature conservation issues. He highlights that the order of things in this title (i.e. man first and then biosphere at the second level) reflects human arrogance and is somehow similar with the situation when someone places himself/herself in the front of his/her own mother (i.e. by saying: “Me and my mother”). Such an order, in his view, is against some ethical fundaments which need to be considered both at societal and nature conservation levels. These hidden/latent ethical/philosophical fundaments may greatly influence our attitude toward nature, our ability to find our correct place in the biosphere, and ways how we build our strategies and the outcome of our activities. It seems that certain fundamental things in our thinking about the nature and us and our relationship with the broad ecological systems around us never change: the caveman seem to be similar with the modern “conservationist” (ok, I am a bit extreme, but I am aware about this and about the fact that I am not an exception from this general and probably sad rule) in this respect, i.e. both say “me and nature” (with its variations, but always the same order). This writing was published in 1993 but it was finished much before that. The author died in 1993. He therefore is unaware about the fact that a new framework is starting to get roots in the academic thinking: the social-ecological framework. What would Juhász-Nagy think about this? What you think about this? How it would sound to reverse the terms, e.g. to say “ecological-social systems”. To be honest, when I reversed the term, I had a strange feeling. What about you? Juhász-Nagy Pál 1993: Természet és Ember. Kis változatok egy nagy témára. Budapest, Gondolat. Is the art more rational or more irrational than science? A number of thinkers (including Lucian Blaga, Mircea Eliade, Juhász-Nagy Pál and potentially many others) expressed concerns about the modern, industrial science which can ‘de-sacralize’ the world with its many technical concepts, definitions, terms and statistics which are not human. Juhász-Nagy Pál argued that the irrational is not anti rational and we should not be afraid of it. He even argued that often the irrational can have more sense than the rational. We need art and tools which generate and mobilize feelings to counterbalance (it is more than complementing) this potential ‘negative effect’ of the modern, increasingly good looking but inside empty, opportunistic, unfairly competitive, intensive, hard, sometimes inaccessible (rather than good, handy, peaceful, slow and sustainable – yes, sustainable, because the information needs time to regenerate) science. Paintings of old trees from Southern Transylvania, made by the famous Romanian painter Stefan Caltia. In a small Hungarian village there was once a man who played the violin every night, while walking up and down the street. People were angry because of this behaviour, but they could not at all convince him to stop it. The next night the violinist goes straight beneath the window of the woman and played even louder and with more passion than usually. He received drink and even cake this time! After a while, however, the window stopped opening and he was not invited inside, no matter how passionate he was. Then he said angrily: “You know what, if you don`t reward me, I will never sing again for you or for others.” And since then, there was silence on the streets throughout the night in that village. The necessity and challenge of reconnecting humanity to biosphere has been addressed in various recent works (e.g. here). In the same time, traditional societies are on the way to de-couple from the ecological systems (e.g. here). To sustainably use natural resources and ‘reconnect’ social-ecological systems it is critical to understand how these systems ‘behave’ and navigate novel challenges of our times. The story and variations around this theme will probabl be endless, including sagas about incentives, competitivity, modern livelihood, governance, human rights, building social capital and so on. But let’s go back in time a bit. We may discover some additional aspects of the problem which may help us in realizing e.g. the limitations of the current way of thinking/approaching the problem. De-coupling from spirituality and cosmos – the world and the cosmos become de-sacralized – as Mircea Eliade the famous Romanian historian of religion would say in his books (e.g. ‘The sacred and the profane’). Fairies and demons disappeared long time ago from nature, spirituality was closed in the church (see writings of Anthony de Mello) and later completely eradicated from the modern society as a result (and replaced with other belief systems e.g. the absolute and unconditioned belief in money and capitalism). De-coupling of individuals from community – this can happen even if the individual is physically present in the community and result in a complete disorganization and chaos and the new mostly individualistic life forms. The slgen of the modern times is ‘realize yourself’ compared to that of the old times which was all about (or largely about) the community. The term ‘Me, I’ have a more central position in the modern life, compared to the ‘we’ of the past. De-coupling from family – e.g. we tend to be spread all over the continent and planet. De-coupling from ourselves – this is the situation when our mind and our body are not anymore synchronized. From a metaphysical perspective individuals and societies showing the above described symptoms are in a ‘death’ state. People in such societies turn in machine like insects and are caught in monotonous, boring activities. Rush increases, hope and happiness decreases. Everything is goal oriented. People don’t notice the beauty of a flower, of the birdsong anymore and forget the taste of a good wine and why not, a good kiss (as noted by Béla Hamvas). People are afraid to be alone, and because of this, probably they are increasingly attracted to noise (as noted by Konrad Lorenz). People are and expect to be directed by financial incentives and nothing else (as the European Union does, e.g. with farmers), somehow in a similar way like dogs are conditioned by a bone. People are increasingly busy with their image in the society: in this race they are unable to balance the social and personal costs of having a good image. In tradition the image and the credit were unimportant – Rene Guenon and others describes a number of artistic creations which are invaluable in our days – of which authors are unknown e.g. because they created for the gods and the eternity, and not to increase their own societal image (the opposite situation is when we ask credit e.g. for every cheap picture we provide…). The ‘metaphysically dead’ state cannot be solved with incentives, strategies, specialized consultancy, facilitation, and creating terms and concepts like ‘ecosystem services’, ‘sustainable development’ and so on. All these ‘tools’ and concepts are the products of the above mentioned ‘metaphysically dead’ system and ‘We cannot solve our problems with the same thinking we used when we created them’ (A. Einstein). To turn back to the problem: re-connecting people to nature is certainly a good way to achieve sustainability. But this is the final stage of a very complex (and in the same time very simple!) multilevel process in which we recover a number of human and societal qualities. Researchers (also) caught in the adaptive cycle? In the last days I scrolled Google Scholar profiles of various researchers. Looking to the citation metrics visualized by Google Scholar I was thinking about the possibility for interpreting citation metrics of researchers within the framework of the adaptive cycle of the resilience theory. If this trial makes you think and reflect – even for some short seconds – I consider this adventure successful. Ecological systems are dynamic systems which go through four main phases: growth and exploitation (r), conservation (K), collapse or release (omega) and reorganization (alpha). E.g. ‘During the slow sequence from exploitation to conservation, connectedness and stability increase and a capital of nutrients and biomass (in ecosystems) is slowly accumulated and sequestered ’ (quoted from here, Figure 1). There are many parallels between the above described phases of an ecological system and a researcher`s publication/citation metric and possibly career. For a researcher the wealth may be represented by the number of papers and citations, and the connectedness (i.e. how well known the researcher is at wider spatial or even disciplinary scales). At the initial stages (PhD and young researcher/postdoc years) everybody starts with an ‘r’ phase: young researchers invest a lot in data collection and developing analytical and writing skills. Connectivity is typically low at this stage (i.e. they are largely unknown) and limited to the supervisor (if the student is lucky, the supervisor is well connected!) and some colleagues. There is a strong desire to ‘know and do everything’ and this sometimes (if the supervisor don`t control it well) can turn into a kind of ‘maniac’ behaviour (i.e. lots of ideas come but the huge enthusiasm makes the poor student unable to select one good idea and finalize it). It is the time of many good publications and the happiness if a paper ends up in a well established journal. Nothing is routine at this stage but a good reason for celebration and professional satisfaction (after each good paper, new citation, review request etc.). Figure 1 shows how the citation profile of a young researcher looks. Regardless the research field and the amount of papers and the h index, the trajectories are near similar suggesting the ‘r’ phase of the cycle. Figure 2. Rapidly growing citation wealth of young researchers in different fields. Being senior researcher and / or professor may coincide with the ‘K’ phase of the cycle. Wealth (including e.g. citations) and connectedness is maximized. Phones and invitations every day, administrative duties, meetings, teaching, review requests every week. Students come to the door and ask for working possibilities. Citations and papers are almost given. (Some professors may even read all the papers they publish!) With all these, the ‘K’ phase is the phase of stability and reputation. How wonderful words! Figure 3 shows the citation metrics for well established (i.e. all in the top five of their topics according to citations) researchers in different (less popular and more popular) fields. Figure 3. ‘K’ phases of a sample of well established researchers from different fields. The omega phase should mean a strong decrease in citations. I don’t found omega phases on my quick Google Scholar survey. Besides the weakness of sampling, the reason for lack of omega phases may be multiple: (i) The ‘K’ stage of well established researchers and professors is permanently fueled by the ‘r’ phases of many enthusiastic young researchers. (ii) A well established researcher may have enough resources/wealth (e.g. innovation, connectedness) which could be mobilised to explore new research fields and opportunities and avoid major collapses. (iii) Last but not least, Albert Einstein`s citations reached an asymptote many decades after his death, showing that brilliant results, ideas and thoughts can survive and be influential long after the brain which created them passed away. If the above thoughts are true, and we, researchers, are indeed caught in an adaptive cycle, what is to be done? Is the academia`s obsession with quantity an inherent feature of our (research, human) system which makes our scientific behaviour and trajectory quite predictable? Thanks to Moritz Meyer for listening these argumentations.